Ada Phillips stood by her father’s grave to remember him with his brothers in the 2-4 during Memorial Day weekend at Russell Cemetery. The 2-4 Magnificent Bastards stood in formation before saying their personal goodbyes to Cassville’s Zackery Phillips, their brother who served with them during one of the most tragic times in Ramadi, Iraq in 2004. For the men and women who have served their country through their military service, there is a silence amongst them from those memories. The inner demons of tragedy and horror rage, no matter what war, and sometimes healing is hard to come by. However, for a group of Marines from the Second Battalion, Fourth Marine Regiment (2-4), a ceremonial rite every year gives them the chance to remember their fallen comrades and talk to the only people who really understand, the ones they served with. 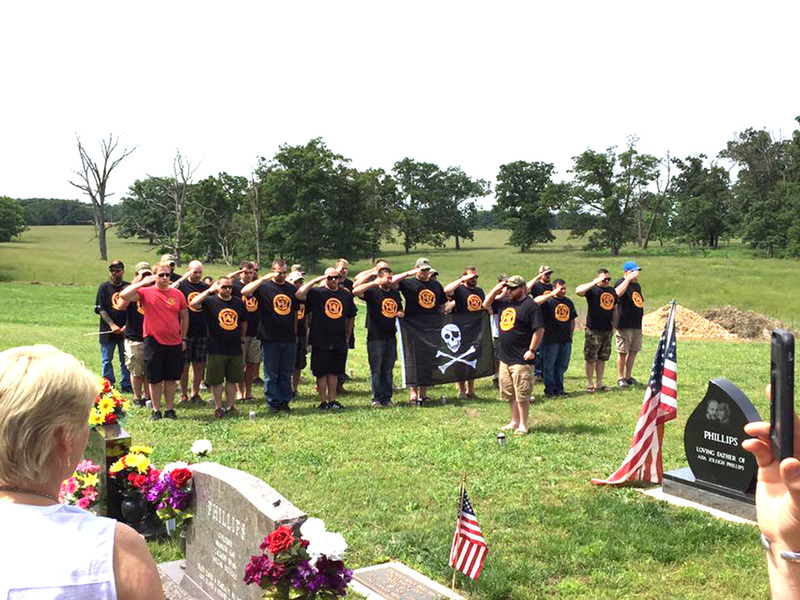 Each year, the 2-4, known for years by their nickname, the Magnificent Bastards, spends Memorial Day weekend visiting the graves of fallen members from their ranks. 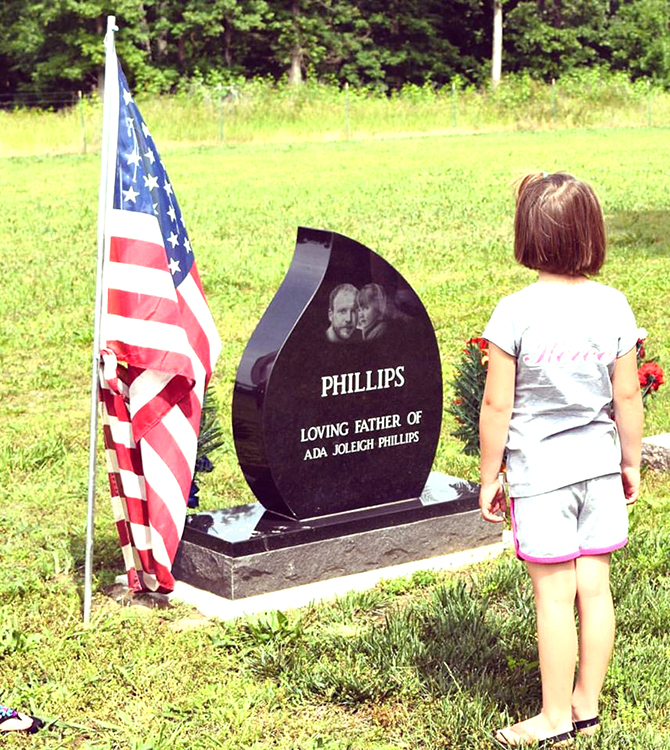 This year, they gathered at Cassville’s Russell Cemetery to remember and say goodbye to Zackery Phillips, a member of the 2-4 who died in 2014. The first time the 2-4 collected to honor one of their own was in 2008. Since then, the men and their families travel to all corners of the U.S. to pay their last respects and visit the families of the men who paid the ultimate price. Phillips said the Marines are visiting each one of the members of the 2-4, always choosing one who died recently if possible. Her son died of heart condition complications in November 2014, but before that, he was one of the Marines visiting gravesides and saying goodbye as well. Each Memorial Day, the 2-4 Marines and their families travel to a different city of a fallen soldier, camp out, talk and then hold a ceremony to honor their brother. The Marines participate each year of their own volition, with no subsidies or payments for their presence. It’s merely an act of service to the fallen, their families and one another to ease the burden of war. The history of the 2-4 is a long one, dating back to World War I. The formation of the 2-4 was activated in 1914. Since, the Magnificent Bastards have been involved in WWII, the Korean War, Vietnam, the Gulf War and Operation Iraqi Freedom. Zackery joined the Marines just after graduating high school in 2003. By February 2014, at only 19 years old, he was serving in Ramadi, Iraq, which would become a devastating place for the Marines. The battalion was charged with providing support and stability operations, but on April 6, the area erupted with intense fighting after insurgents attacked. Phillips said April 3 through 6 is considered one of the most intense times because of the casualties suffered. Between April 6 and 7, 14 men died in the ambush in Ramadi. Since the War on Terror began, over 30 men from the 2-4 have died. Zackery served during the most disastrous time for the Magnificent Bastards, but he survived to come home. He moved back to Cassville when he was completed his service in 2007. When he died in 2014, he left behind a three-year old daughter, Ada. When the 2-4 paid their respects to Zackery, Ada was there, remembering her dad in a somber Memorial Day ceremony. But for the Magnificent Bastards and their families, Ada is one of their own, as is Joy and all who Zackery left behind. That is a fact that will remain as long as there is a single member of the 2-4 left.